I optimize WordPress without an SEO plugin. The reason is because SEO Plugins have more features than I need. I have been asked many times to share how to do SEO with WordPress without an SEO plugin. Here is how to do WordPress SEO without an SEO Plugin. This article is not intended to persuade you to not use an SEO plugin. It’s purpose is to show you how to take full control of your SEO without a plugin, just like I do. SEO plugins are recommended solutions for publishers who cannot code PHP, who are lost with HTACCESS files and for whom robots.txt files are a mystery. The technical side of SEO has a relatively high bar in terms of coding. SEO plugins democratize web publishing. A major complaint about SEO plugins is how bloated with unnecessary features they are. But this isn’t the case across the board. There are SEO Plugins that are lean and fast as well as modular, so you can choose which SEO features you need. An example of this kind of SEO plugin is The SEO Framework. It’s an excellent choice for those who want more control over their SEO but prefer to pick and choose the features they need. SEO plugins are the safe choice for publishers who are risk averse and don’t want to experiment with alternatives. A lot is at stake so the best choice is often the most trusted solution. This article is not intended as an encouragement to dump SEO plugins. Quite the opposite, I encourage publishers to stick with their SEO plugin of choice if that is what makes them comfortable. This article is for publishers interested in exploring how to do SEO without an SEO plugin. This year, because of the headaches caused by an SEO plugin bug, I launched a site without any SEO plugins. I was happy with my results and transitioned other sites away from SEO plugins. The reason I moved away from a single SEO plugin is because after reviewing existing solutions I concluded that, for me, I could control a website’s SEO better without a dedicated SEO plugin. I had made a round trip journey back to where I originally started with WordPress: I returned to optimizing WordPress without a dedicated SEO plugin. There are four reasons why I don’t use an SEO plugin. Don’t believe me that SEO Plugins are buggy? Visit the changelog for your favorite SEO Plugin and read about all the bugs being fixed week after week, month after month. Some (not all) of those SEO plugins are a bug fest. WordPress has a fairly robust core nowadays. Things like canonicals are done automatically. Many WordPress themes contain SEO features like schema markup, breadcrumb navigation, Open Graph meta data and so on. The following are the SEO features you will need. Your exact needs will vary according to the template you use. A way to easily add nofollow attribute to selected links. Breadcrumbs is a useful feature. Adding Schema structured data to it will get you enhanced listings if you rank in the SERPs. The enhanced listings may help the click through rate. It’s possible to code a breadcrumb navigation without a plugin. The code is supposed to go into your website’s “child” functions.php file. Most tutorials say to add it to your theme’s function.php file but you’ll lose your breadcrumbs if the theme is updated and the functions.php file is part of that update. Getting the breadcrumbs right can also become complicated because you still need to associate schema markup to the breadcrumbs. So that’s even more coding. It can be done but at this point, in my opinion, it might be easier to offload the responsibility of making sure it works to a plugin. I have found that using BreadCrumbs NavXT WordPress Plugin is an adequate solution. It handles the breadcrumbs and the schema data. The NavXT plugin was the subject of a medium level vulnerability but it was quickly patched. This was unusual for this plugin and unlike more serious events associated with dedicated SEO plugins, this issue did not cause problems for it’s users. I have found Easy WP Meta Description to be an adequate solution for meta descriptions. Meta descriptions aren’t a ranking factor. But they do show in the SERPs if you rank. Google will rewrite your meta description if a phrase from your web page is a better match. That said, Google does a fine job (in my opinion) of providing a relevant snippet from your page. So it’s up to you. You can add your own meta description or let Google tell the user why your site is relevant to the query. I craft an article title that is adequate to use as a title tag. If it’s good enough to serve as the title of the article, it should be good enough as the title of the web page. There are workarounds for coding this into the theme as well as plugins. But I think those are superfluous. Strictly speaking, this isn’t an SEO feature. It is a feature that could influence how much traffic goes to your site. It allows you to specific an image and wording to show when your URL is shared on Facebook and Twitter. Open Graph Meta Data plugin helps you present a professional appearance that will appeal to potential site visitors. The word “category” isn’t necessary in your URL structure. Shortening your URL to the domain name, the actual name of the category, and the page name is a best practice. A shorter URL is easier to remember, less likely to be mistyped, and can tell users and search engines what the page is about using the least amount of words. Read more about the Remove Category Base plugin here. The Schema WordPress plugin will integrate most Schema structured data that you’ll need, including reviews, article schema, and so on. Schema markup can be coded by hand as well. For example, you can take the JSON-LD script for reviews and paste it into the bottom of your review directly into the WordPress editor while in Text Mode. Then manually adjust the descriptive fields for rating, product name, etc. Pretty much every element of structured data can be hand crafted and manually or even automatically inserted on a post by post basis or by editing your template directly. You don’t have to use a plugin, but the plugin is clearly the best way to scale this process and have it up to date no matter how often WordPress updates. The Ultimate Nofollow plugin adds the option to make a specific URL nofollow at the moment you are creating that URL. There are additional options for sitewide nofollows, should you need those. But I don’t use them. If you have inadvertently created web pages for every image attachment in your WordPress site, this plugin will easily solve your problem. The Attachment Pages Redirect plugin will restore your individual attachments to their correct behavior. Just install and activate it and that’s it, your problem is solved. The Attachment Pages Redirect plugin needs no setting up. Just activate it and forget it. Fixing rogue attachment pages couldn’t be easier. Just make sure that in the future, when uploading media, to use the correct setting for redirecting attachments to the post. This is a useful plugin if you feel uncomfortable editing htaccess files to create redirects. Use this if you have a legitimate reason to redirect an old page to a new page. Don’t use a redirect manager to redirect a deleted page to the home page. Some SEO plugins try to scare you into believing that 404 error codes affect the “health” of your site. But that is incorrect. 404 response codes are not inherently harmful to the “health” of your site. Some 404 responses are due to spammers linking to your site with a partial URL. That’s normal and nothing to worry about. The 404 response is the perfect response. Some 404 responses are due to an internal linking error by the publisher. That’s your error (you mistyped the URL). That’s something to fix by updating the URL to the correct URL. The truth about 404 response codes is that they are perfectly natural and do not make your website less healthy. “There’s no need to “fix” crawl errors on your website. Finding 404’s is normal and expected of a healthy, well-configured website. Google’s John Mueller explains that 404 response codes will not harm your sites rankings. Google can also discover the web page through the normal process of crawling from link to link. Another option is that you can choose to submit the URL individually or through a site map, complete instructions from Google here. If your site is not updated often, you can crawl your site with an app like Xenu Link Sleuth and choose the option to create an XML site map. Then you just upload it to your server, no web hosting resources are needed to generate the map other than allowing Link Sleuth to crawl your website. Or you can use a plugin like the Google XML Sitemap Generator plugin. There are features included in SEO plugins that in my opinion are redundant or not necessary. Canonical URLs are built into WordPress. You don’t need an SEO plugin to handle this. If you have a text editor or an HTML editor, then you have all you need for editing a robots.txt file or updating an htaccess file. Additionally, you should only mess with those files if you know what you’re doing. If you are skilled enough to edit these, then you don’t need a WordPress plugin to handle this. Just open your text file and an FTP app like a normal person, right? SEO plugins provide this under the mistaken belief that 404 status codes are harmful. 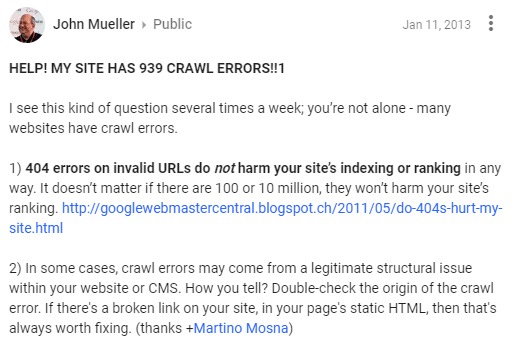 As noted above by Google’s John Mueller, 404 response codes are fine. Just fix the ones that are due to actual errors, like a typo in the URL. As noted above, a site map is not strictly necessary because Google crawls URLs via RSS feeds and links. However, a site map is useful if you have made major changes and want Google to discover them as fast as possible. In this case a manually generated site map is useful, as you don’t have to install a plugin to generate it. You can still install a site map generator plugin and that makes far more sense to do than installing a huge SEO plugin to do this one single task. Promotional links are common in free software. However, many publishers are unaware that some SEO Plugins creates a promotional link back to the plugin author from the XML site map it generates. Many SEOs prefer to control who their sites link to. A promotional link from an XML site map is your choice and a small price to pay for free software. This is an example of a promotional link to an SEO Plugin generated from a sitemap generated by an SEO plugin. Publishers are sometimes surprised to learn that some SEO plugins generate a promotional link from their XML sitemap. WordPress and your server resources might not be the best platform for conducting keyword and word processing functions. If you want a real world app for checking your content, use a real software program like the Hemingway App. If you want to do web page analysis use a real app that generates a word cloud. All of these kinds of functions are limited on an SEO plugin anyway. A standalone app will do a better job, in my opinion. Why Use Six Plugins Instead of One? An all in one SEO plugin might be just a single plugin, but it’s still behaving as if it’s ten or more plugins. Count the features on your SEO plugin and count each one as a single plugin. You’ll be surprised that you could be larding up your WordPress site with the features of twelve plugins, features that you may not need. So the question shouldn’t be about whether you need six plugins versus one. The question should be how many features do you need? For me, the clear answer is a lot less features that are offered by all in one WordPress SEO plugin solutions. The exception to that is The SEO Framework WordPress plugin because it is modular. You can pick and choose which components you want. As you can see, SEO plugins are useful for users who have little to no skill with coding or WordPress. SEO plugins accomplish an important task for users who don’t have the skills to choose what solutions they need. A dedicated SEO plugin is a good choice for a large organization that wants to play it safe and not have to deal with individual plugins or hand crafted solutions. However, for those with more skill or aren’t constrained by a bureaucratic constraints, SEO plugins can be overkill. A certain amount of laziness has crept into the industry where people are installing SEO plugins without thinking about what they need for SEO. People are installing SEO plugins by default, essentially sleepwalking through their WordPress SEO. This article shows that you don’t need everything a dedicated SEO plugin offers. There are alternatives to installing an SEO plugin with features you don’t really need. An all in one solution may not be what you need.